The last couple of days, several details and photos of the GeForce GTX 1060 hit the web. Cards are confirmed to be in the hands of reviewers and now a bunch of specifications leaked. The new card features a GP106 "Pascal" GPU made on a 16nm FinFET process, it features 1280 CUDA cores and if a leaked GPU-Z screenshot is accurate it has a 1506MHz core clockspeed, 1709MHz Boost, and 6GB GDDR5 memory clocked at 8000MHz effective. The card has a 192-bit memory bus and should have memory bandwidth of 192GB/s. The thermal design power (TDP) is said to be 120W, which is 30W less than the official TDP of the Radeon RX 480. According to VideoCardz, the card launches in a couple of days but it appears this will be a paperlaunch event and reviews may appear at a later date. 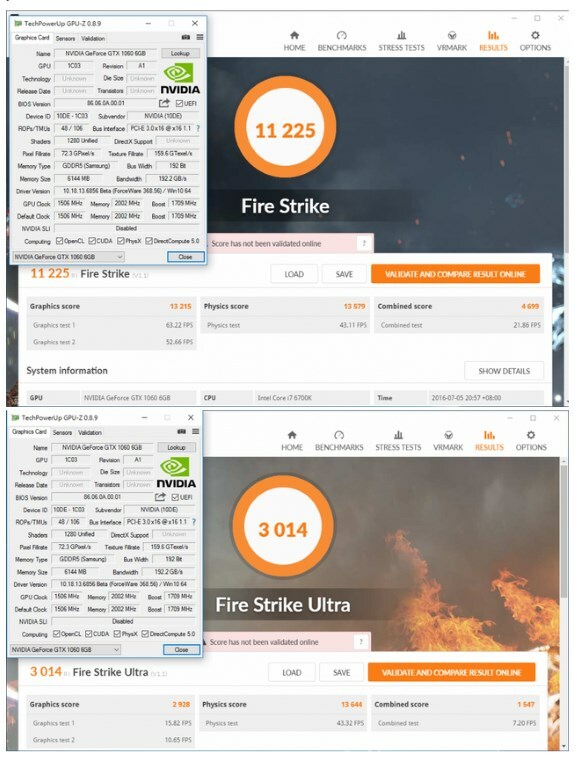 The same leaker also posted Fire Strike benchmark results, these suggest the GeForce GTX 1060 may beat AMD's Radeon RX 480 by about 8 to 10 percent. Performance-wise the card is about on-par with the GeForce GTX 980. There are rumored to be 3GB and 6GB versions of the GTX 1060 but the big question that still needs answering is how competitive NVIDIA will price the GeForce GTX 1060 lineup. My guess is NVIDIA is not going to compete on price as the Radeon RX 480 appear to be a smaller threat than expected.